Jack Wilshere is in Arsenal's squad for Wednesday's Champions League Group D match against Galatasaray but Aaron Ramsey and Mikel Arteta miss out. Fellow midfielder Abou Diaby is likely to be rested following a hip problem. 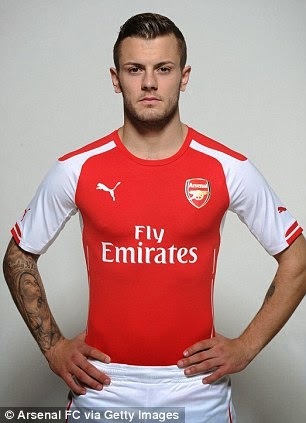 Wilshere (ankle), Ramsey (hamstring) and Arteta (calf) were all injured in Saturday's 1-1 draw with Tottenham. "Jack was a doubt but recovered quite well," said Gunners boss Arsene Wenger. "Whether he starts or not, I have to be cautious about, but he's in the squad." Ramsey and Arteta are out for up to a month, joining a growing Arsenal injury list. Wingers Theo Walcott and Serge Gnabry (both knee) are sidelined until after the international break at the start of October, which is when defender Nacho Monreal (back) and Yaya Sanogo (hamstring) are also expected to return. Full-back Mathieu Debuchy (ankle) and France forward Olivier Giroud (fractured foot) are also out with longer-term injuries, but Wenger is confident Arsenal can cope without all of their absentees. "We have plenty of options," Wenger said. "I believe we have a strong squad and we want to use that during the season." Wenger admits his team are under pressure to beat the Turkish side after losing to Borussia Dortmund in their opening group game. "We are maybe more under pressure to win than if we had won the first," Wenger explained. "In the group stage you need a minimum of 10 points so the home games are vital. "Basically the target [to get out of your group] is always the same in the Champions League - you need to win your home games and you need one good result away from home. "We had a disappointing result in Dortmund and the potential is there for us, we don't lose a lot but we want to find the winning edge together and we have that opportunity against Galatasaray." On Wednesday it will be 18 years since Wenger, 64, took charge of the Gunners but the Frenchman says the only way he wants to celebrate the landmark is with a win. "I have no time to look back right now, but it is a great privilege to be in charge of such a big club for such a long time," he added. "I just want to meet the expectation level of this club and win the Galatasaray game. Our job is always to win the next game."